A while back I made these Chicken Tikka Masala Meatballs and y’all went crazy for them. I don’t blame you though because they’re delicious chicken meatballs cooked in a homemade flavorful tikka masala sauce, what’s not to like?! And because they were such a hit, I decided to give you another meatball skillet recipe to obsess over. I’m obsessing over it, and so I’ll just feel better if I weren’t the only one. These Skillet Enchilada Meatballs are cooked in a thickened enchilada sauce with sliced tortillas and lots of cheese. They’re a much easier way to make and eat enchiladas, but better yet, meatballs are involved and I’m always down for a dish with meatballs in it. Top it with your favorite taco fixings for that ultimate Tex-Mex dish that is perfect for weeknight meals, weekend family gatherings or even potlucks! Meatballs speak my love language and when they’re by themselves they’re sending me all the right signals, but when they mosey on over and place themselves on top of pizza, that’s a whole other story. That’s the ultimate love story right there. Don’t even get me started. Since I’m in Italy at the moment I thought it would be a great idea to share a pizza recipe on the blog, mainly because it’s been a while since my last pizza which I believe was this Spicy Sausage, Potato and Kale Pizza. I’m not mad about it, I just think it’s about time I shared some more of this glorious dish. Nothing screams Italian more to me than meatballs and/or pizza. Rather than having to decide between the two, I thought the wisest decision I could possibly make right now would be to put meatballs on my pizza. Now I’m not saying I invented this by any means, because let’s face it, people have been putting tiny balls of meat on pizza forever now. What I am saying is that I’m jumping on the delicious band wagon and trying to get you guys to hop onboard as well. I’m taking a few shortcuts and some help from the store by using store-bought pizza dough and pizza sauce because when you really want pizza, you don’t have time to mess around with making your own dough and sauce. Instead, I’m investing my time to making the most delicious homemade meatballs to go on top of the pizza. That’s where it really counts. That’s where it matters the most. If you really want to go all semi-homemade on this pie, feel free to use frozen meatballs and just cook them in the oven in a baking sheet before placing them on the dough before cooking the pizza itself. But if you have that little bit of extra time, I highly recommend that you give the homemade meatballs a whirl. They’re actually fun to make, but I guarantee you that it’s not nearly as much fun as the pizza is to eat. Pizza is always fun. It’s the life of any party. I’ve been on a major appetizer kick lately, as you can tell from all of the appetizers I’ve been posting recently (there are still some great ones coming up really soon so I hope you’re not tired of this direction). I feel like everyone needs a good arsenal of appetizers up their sleeves to choose from, just in case you need to entertain a horde of people at the very last minute. Starters for some reason are always the hardest for me to decide on. I want that first bite that people taste to be very special, so I take my time in deciding what to make. I figure that with all of these appetizers on the site, it’ll make it easier on you when you go to plan your next dinner party or celebration. My newest addiction comes from my love of tapas restaurants. The idea of having an entire meal comprised of small dishes that are meant to be shared with your friends and family, with a few cocktails in hand obviously, just sounds fun and exciting, doesn’t it? It does. I’ve been to a few restaurants that actually serve spicy meatballs as an appetizer. I order them all the time because what’s not to love about meat rounds cooked in a red tomato sauce, sans pasta? Most of the time they’re always Italian flavored, which makes sense because spaghetti and meatballs, but I wanted to think outside of the box and give this favorite appetizer of mine a makeover. Whenever I want to make anything over, I automatically think Mediterranean because I feel like those fresh flavors have so much potential and can really transform almost anything. These Spicy Mediterranean Meatballs taste just like a Greek salad, if a Greek salad was filled with ground beef and pork. The ultimate Mediterranean meatball would actually be made with ground lamb, because that just makes sense to me, but I’m not always a fan of lamb so I decided to keep some traditional things the way they were hence the ground beef and pork. So the next time you’re looking for a great appetizer to impress a crowd, remember that I made these meatballs once and they were irresistible. Let’s be honest, not every night is fancy dinner night. We’re not always in the mood to spend hours in the kitchen making a complicated meal, no matter how hard we try. The honest truth about it all is that even though we wish we could be Martha Stewart every single day of our lives, it’s unrealistic and not always doable. Things come up. We’re only human. Don’t be too hard on yourself. There are certain nights when tuna sandwiches, simple tacos or even a quick bowl of cereal make an appearance (as we eat standing up) and we call it good. You know the days I’m talking about. We don’t complain because we simply do not have the time or quite frankly, the energy to put much effort in the kitchen. But on those rare special occasions when we’re looking for something with a bit more glamour than cold cereal, it’s nice to venture out and make a meal that’s not only rich in flavor, but also super easy to make, while still looking like we’re royalty. We deserve to treat ourselves whenever possible. 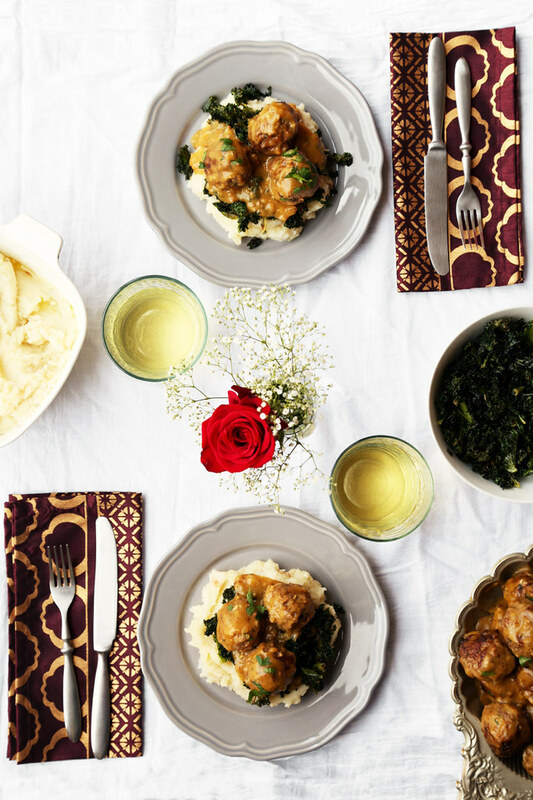 Dinner for Two: Braised Meatballs, Roasted Garlic Mashed Potatoes & Roasted Kale is here to save the day. This is us taking an everyday classic and turning it into something a bit more fancy. This is us saying we don’t want cereal for breakfast. Braising the meatballs in a delicious pan gravy sauce not only makes them incredibly flavorful, but also allows them to cook for a while without drying out. Think Swedish meatballs but not because I’m not Swedish and I don’t even know what goes into Swedish meatballs. Roasted garlic takes the mashed potatoes to a whole new level. A one way ticket to Flavortown. And of course, the roasted crispy kale just makes us seem cool and hip since kale is everywhere at the moment. We’re just keeping up with the Joneses and I’m totally fine with that because roasted kale is sort addictingly tasty. I’m not even sure if addictingly is a word, but I’m making it one now. With Valentine’s Day just around the corner, I didn’t want you to get caught off guard. Especially all my late planners out there, so I decided to share these recipes with the hopes that you’ll surprise your loved one and make them a romantic meal at home. 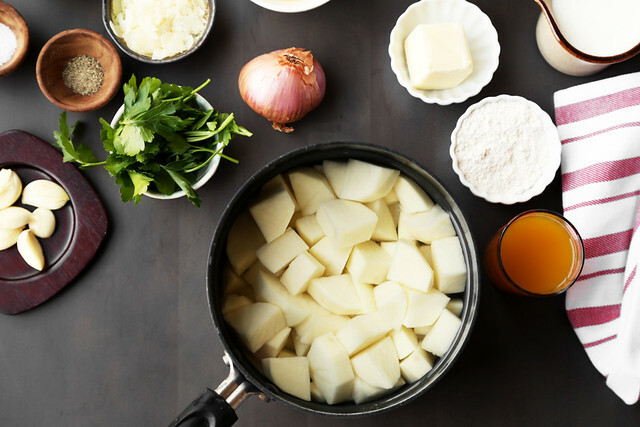 Anyone can make a reservation at a restaurant, but not everyone can whip up a great home-cooked supper. So go ahead and cancel those reservations and get yourself to the grocery store! You only have two days to get everything together. Have no fear though, I know you can pull it off. I have all the faith in you. For some wild unknown reason, I have a soft spot for sliders. I think everyone does, and if you don’t, well then we have some real issues we need to discuss before we can be friends. I’m always trying to come up with new and exciting ways to make mini-burgers. This might be because my life motto is that if it has “small, mini or bite-sized” in the name, it only means you can eat a lot more without feeling guilty. I’m certain that’s the only reason they were invented. Tiny burgers don’t have the same calories as their normal-sized counterparts, so eat as many as you want. You can quote me on that. Let’s write it on t-shirts and sell them. Get the news out there as much as possible. I may or may not be a seasoned slider professional by now. Perhaps you’ll remember some of my very favorite posts on here; BLT Biscuit sliders are everything we want brunch sliders to be. Let’s not forget about that time I went all Southern comfort and whipped up these Fried Green Tomato and Shrimp Sliders, I’ll never forget that day and you shouldn’t either. I’ll make sure you don’t. But perhaps you’ve once had the same fascination with pot roast as me and made these Pot Roast Sliders. They combine two of my favorite dishes into one flavorful package between two buns. 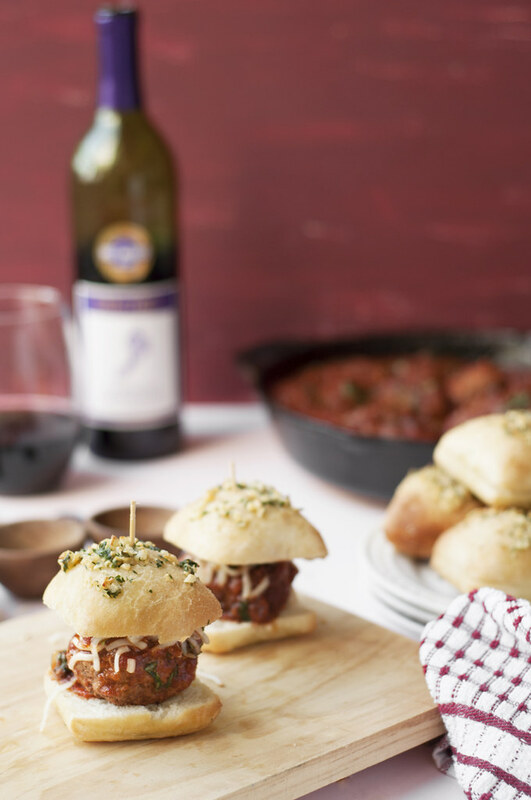 These Cabernet Sauvignon Meatball Sliders, made with Barefoot Wine’s Cabernet Sauvignon, are a great party appetizer or snack. Most people see sliders as being a starter to a great meal, but I see them as being the perfect meal. I make them for dinner all of the time. 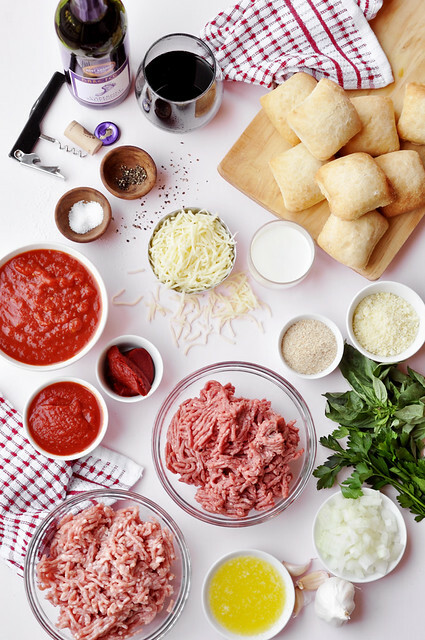 Maybe you’re a meatball aficionado and you’ll fall in love with the tasty red wine marinara and tender meatballs that are sandwiched between a mini garlicy ciabatta roll. You’ll definitely fall in love with the fact that there’s cheese and wine involved, I know I did.